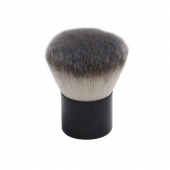 Our synthetic brushes are made of a high tech synthetic fiber with the ultimate softness and durability. They are very popular for those with skin allergies, sensitive skin, and vegans. The ultra-dense bristles enhance the natural blendability of mineral pigments, buffing on your skin for a completely uniform and even application. The result is a visibly soft, smooth, flawless complexion with an airbrushed finish.